This recipe for Seared Halibut with Chanterelle Mushrooms is a perfect late-summer dish in California and the Northwest, when chanterelles and halibut are both in season. It is an easy dish to prepare (40 minutes from start to finish) with upscale treatment with the addition of a ginger-chanterelle sauce. Pair this with a crisp white wine and crusty bread, and your meal is complete. Can't find chanterelles? No problem -- this works just fine with any mushroom, or any firm white fish, such as walleye, flounder, seabass, cod, haddock, etc. This recipe serves two but can be doubled. Salt the halibut lightly and set it aside at room temperature for 15 minutes. Heat oven to "warm" (about 200 degrees F.) so you can keep the prepared halibut warm in the oven while you make the sauce. Get a large saute pan hot and then pour in the grapeseed or canola oil -- both are neutral-tasting and have a high smoke point. Let the oil get hot over medium-high heat, about a minute or two. Pat the fish dry, then lay it into the pan so the pieces are not touching each other. Do not crowd or you will not get a good sear. If you are using fillets with skin, sear the meat side first, not the skin side. If the halibut is more than 1 inch thick, turn the heat to medium. Either way, cook for 2-5 minutes -- the longer the cook time, the thicker the fillet -- and flip only once. Cook only 2-3 minutes on the skin side, then remove the halibut to a pan, skin-side up. Lightly salt the skin and place in the warm oven. Prepare the sauce. In the same pan the fish was cooked in, add the chopped shallot and mushrooms and toss to coat with the pan drippings, adding a tablespoon of butter. Tossing or stirring often, let this cook over high heat for 2-3 minutes. Add the ginger and the lemon zest and toss to combine. Add the white wine immediately, and turn up the heat to high. Scrape up any browned bits on the pan with a wooden spoon. Let this boil furiously until the wine is nearly gone. Turn off the heat and add the remaining 2 tablespoons butter and lemon juice. Swirl to combine. 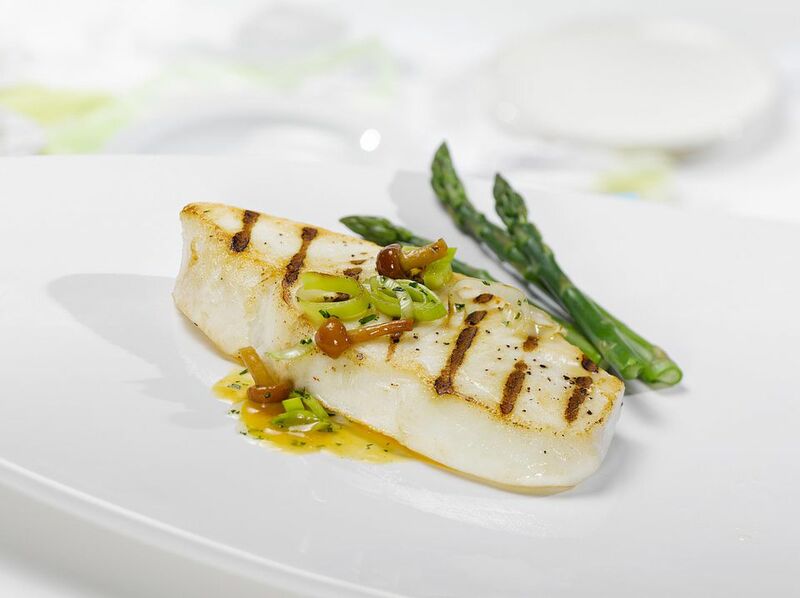 Serve the sauce under the halibut, skin-side up.